To understand the brain, molecular details need to be overlaid onto neural wiring diagrams so that synaptic mode, neuromodulation and critical signaling operations can be considered. Single-cell transcriptomics provide a unique opportunity to collect this information. Here we present an initial analysis of thousands of individual cells from Drosophila midbrain, that were acquired using Drop-Seq. A number of approaches permitted the assignment of transcriptional profiles to several major brain regions and cell-types. Expression of biosynthetic enzymes and reuptake mechanisms allows all the neurons to be typed according to the neurotransmitter or neuromodulator that they produce and presumably release. Some neuropeptides are preferentially co-expressed in neurons using a particular fast-acting transmitter, or monoamine. Neuromodulatory and neurotransmitter receptor subunit expression illustrates the potential of these molecules in generating complexity in neural circuit function. This cell atlas dataset provides an important resource to link molecular operations to brain regions and complex neural processes. Neuroscience is typically studied at the systems, cellular, or molecular level. However, it will be necessary to bridge these traditional boundaries to fully understand how the brain operates. Such a momentous task is somewhat simplified if analyses are focused on an animal with a relatively small brain, but where systems-level processes are evident. In many respects, the vinegar fly Drosophila melanogaster fits the bill (Haberkern and Jayaraman, 2016). Drosophila have an estimated 150,000 neurons in the entire brain, of which the optic lobes, or visual neuropils, comprise two thirds of this neural mass. The remaining approximately 50,000 neurons, or midbrain, houses many key neural structures such as the mushroom bodies and central complex, which are, amongst other things, critical for memory-directed behavior (Cognigni et al., 2018) and navigation (Seelig and Jayaraman, 2015), respectively. Recent large-scale electron-microscopy projects have generated wiring diagrams, or connectomes, of parts of the larval and adult fly nervous system (Berck et al., 2016; Eichler et al., 2017; Ohyama et al., 2015; Takemura et al., 2013; Takemura et al., 2017a; Takemura et al., 2017b; Tobin et al., 2017; Zheng et al., 2017). While these efforts are an essential part of the quest to decipher brain function, they are not enough. Genes determine the anatomy and mode of connectivity, the biophysical properties, and the information-processing limits of individual constituent neurons. Therefore, understanding any given wiring diagram requires a systematic view of gene expression within their functionally relevant cellular context. With this knowledge in hand, investigators can begin to examine how gene products contribute to cell- and circuit-specific functions and, ultimately, organismal behavior. New developments in single-cell sequencing technology provide a unique means to generate such a brain-wide view of gene expression with cellular resolution. Massively parallel approaches, such as Drop-seq (Macosko et al., 2015), permit simultaneous analysis of the transcriptomes of 1000 s of individual cells. In brief, each cell from a dissociated tissue is first captured with an oligonucleotide bar-coded bead in a nanoliter aqueous droplet. Inside each droplet, the same cell identifier sequence becomes attached to all mRNA molecules from an individual cell. Following this critical cell-specific hybridization step, all the material from 1000 s of individual cells can be pooled and processed together for mRNA sequencing. Drop-seq therefore provides the means to access the transcriptomes of a representation of most cells in the fly midbrain. 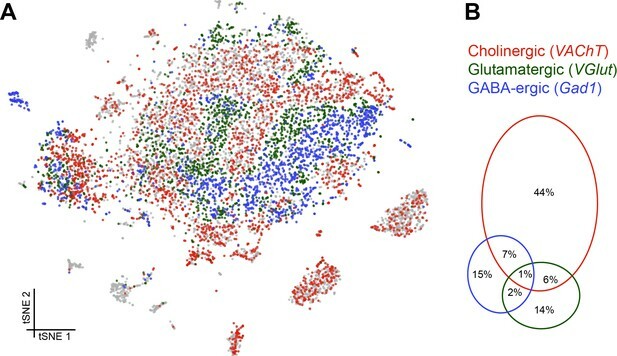 A key hurdle in generating a single-cell atlas of the brain is the ability to assign individual transcriptome profiles to the correct cell, or at least cell-type. Again, using an animal whose brain has an intermediate number of neurons and presumably neural diversity simplifies the task. Moreover, years of genetic analyses in Drosophila have provided a considerable number of established transgenic and intrinsic markers for specific brain regions and cell-types. These identifiers often allow one to extract the relevant cell profiles from the larger dataset. Here we report the application and an initial analysis of Drop-seq data to investigate the cellular diversity of the Drosophila midbrain. We demonstrate the ability to assign many single-cell profiles to identified cell-types and brain regions, and identify novel markers for these regions. Moreover, cells can be robustly classified based on their neurotransmitter profile. We find that certain neuropeptides preferentially accompany particular fast-acting transmitters, or monoamines. In addition, we detail the apparent complexity of modulatory and neurotransmitter receptor subunit expression. 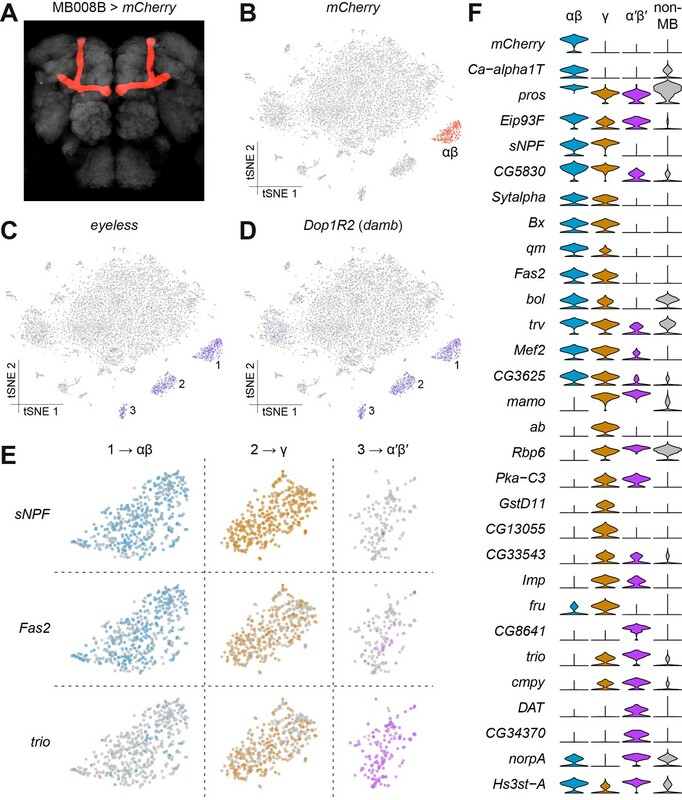 This single-cell dataset provides an indication of the extent of neural diversity in the fly brain, and provides essential cellular context linking molecules to neural circuits and brain function. We first optimized the conditions required to effectively dissociate and capture individual Drosophila melanogaster cells with DNA bar-coded microparticles in aqueous droplets, using a commercially available apparatus. Drosophila neurons are about a tenth of the size of mammalian cells. We therefore first verified the efficiency of processing insect cells and of single-cell capture by generating single-cell transcriptomes attached to microparticles (STAMPs) from a cell suspension comprised of a 1:1 mixture of Drosophila S2 and Spodoptera frugiperda (fall armyworm) Sf9 cultured cells. We then sequenced these S2/Sf9 STAMPs (Figure 1—figure supplement 1A). This procedure retrieved 764 barcode-associated transcriptomes, of which 368 were identifiable as Drosophila and 384 as Spodoptera. Importantly, only 12 transcriptomes contained cDNA coming from both species (Figure 1—figure supplement 1B), indicating that only 3.2% of all sequenced transcriptomes resulted from capturing two cells together. This analysis suggested that the Drop-seq system and our chosen parameters are suitable for barcoding single insect cells and are optimized to minimize capture of cell doublets. We next used these same parameters and concentrations to collect STAMPs from thousands of cells from the Drosophila midbrain, in eight independent biological replicates, over eight different days. Each day we isolated single-cells from 80 to 100 dissected brains taken from an equal number of male and female flies. Brains were removed from the head capsule, optic lobes were manually dissected away and a single-cell suspension was prepared from the remaining fly midbrains. Larger tissue fragments were removed by filtration, and the eluant was inspected under a microscope to confirm the presence of single cells and the absence of clumps. Cells were individually paired with DNA barcoded beads and cDNA libraries were generated from bead-bound single-cell transcriptomes, and sequenced (Figure 1A) (Macosko et al., 2015). Pooling the data from the eight independent experiments resulted in a dataset of 19,260 cells, with each containing between 200 and 10,000 unique molecular identifiers (UMIs) and therefore, single mRNA molecules. We performed a Principal Component Analysis (PCA) on these transcriptomes and reduced the top 50 PCs into two dimensions using t-SNE (Van Der Maaten, 2014) (Figure 1—figure supplement 2A). We selected the cut-off for the optimal number of UMIs per cell to be included in our analyses by generating t-SNE plots from data with a variety of quality thresholds. 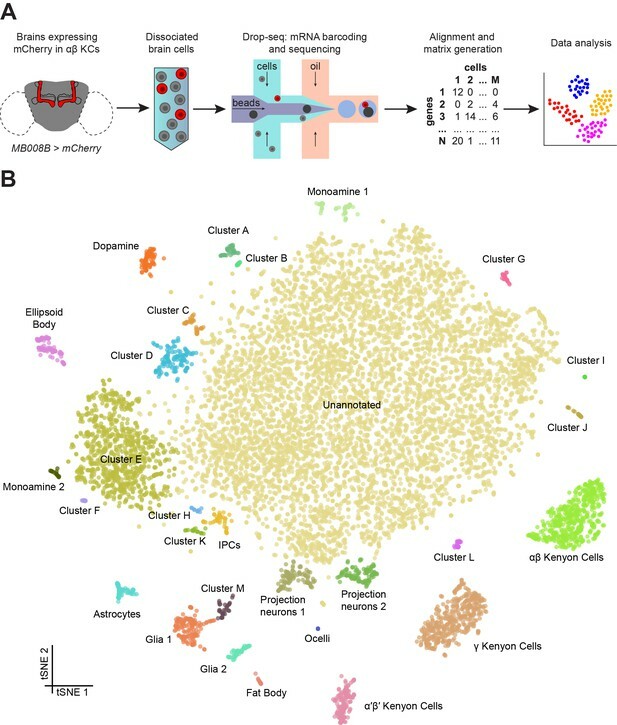 These analyses revealed that discarding cells with less than 800 UMIs, resulted in a data set of 10,286 high quality cells, segregated with k-means clustering into 29 cell clusters, with several corresponding to most of the known iterative, or large populations of, cell types in the Drosophila brain (Figure 1—figure supplement 2B). More stringent criteria decreased the number of cells included without further improving the clustering (Figure 1—figure supplement 2C). A comparison between our eight individual replicate experiments revealed that all of them contributed equally to all but one cluster (Figure 1—figure supplement 3). We therefore chose to use the 10,286 cells that have ≥800 UMIs from our eight pooled replicates for our subsequent analyses. Drop-seq reveals neuronal clusters in the Drosophila brain. (A) Schematic of the experimental procedure. Drosophila brains were dissected and dissociated prior to Drop-seq. After sequencing and alignment, a digital expression matrix containing information about the number of UMIs found for each gene, in each cell, was generated and used for PCA and subsequent analyses. See Materials and methods section for details. (B) Two-dimensional representation (t-SNE) of 10,286 Drosophila brain cells, manually classified into 28 clusters. Based on the recovery of cell-types of known abundance in the brain, we estimate that there are 45,000 cells in the fly midbrain. We assessed the transcript drop-out rate by determining the number of neurons that express the male-specific long non-coding RNA on the X 1 (roX1) gene (Kelley and Kuroda, 2003; Amrein and Axel, 1997). For this analysis we excluded non-neuronal tissue, and Cluster M – see descriptions below. The distribution of neurons containing UMIs for rox1 was biphasic, with one peak at 0, and another at 9 UMIs (Figure 1—figure supplement 4A). Since our data were prepared from an equal number of male and female brains we reasoned that these two cell populations correspond to neurons from female and male flies, respectively. We used the median between the two peaks (4.5) as a cut-off to separate the two populations, which revealed that 55.9% of neurons are positive for roX1 (Figure 1—figure supplement 4B). Since this number is greater than 50%, this distribution suggests that drop-out of the roX1 transcript is low in our high-quality dataset. However, given that the drop-out rate for each gene is influenced by the expression level and other factors that influence the ability to capture transcripts from the cell bodies using the polyadenylated tail, it is not possible to determine a global drop-out rate. Nevertheless, the rate of roX1 drop-out provides a useful measure to compare data between different samples and preparation techniques. The neuronal Cluster J is almost exclusively comprised of roX1-negative cells. This could either mean that cells in this cluster are only present in the female brain, or that they represent a subset of roX1 negative neurons that are present in both male and female brains. We manually annotated 30 clusters in the t-SNE plot of 10,286 cells, with each containing between 9 and 7167 cells (Figure 1B). For each cluster, we identified a series of genes whose expression was significantly higher than in the rest of the brain (Figure 1—source data 2). We then used the published expression patterns for many of these genes to assign identity to several clusters (Figure 1—source data 2). This approach allowed us to identify the mushroom body Kenyon Cells (KCs), olfactory projection neurons (PNs), ellipsoid body ring neurons, monoaminergic neurons, astrocytes and other glia, and insulin producing cells (IPCs). We also identified a few cells from the ocelli, in addition to fat body tissue, some of which is present in the head capsule and therefore is also expected to be included in our dissected brain tissue. We also identified 13 additional cell clusters that we could not at this time assign to a particular neuronal type, and that we name with the letters A-M. Surprisingly, cluster G only contained cells obtained from a single replicate experiment (Figure 1—figure supplement 3). The largest cluster of all contains 7167 cells with a variety of expression profiles, that at this stage of analysis, we marked as ‘unannotated’, but that can nevertheless be segregated for example, based on their primary fast-acting neurotransmitter (see below, and Figure 5). The easiest and most certain way to assign a Drop-seq cluster to a specific cell-type is to track the expression of a transgenically expressed marker. For this reason, our single-cell expression dataset was generated from a genotype of flies that express an mCherry transgene specifically in the αβ subset of mushroom body KCs (Figure 2A). To our surprise, visualizing mCherry expression levels in our dataset revealed labeling of a very distinct group of cells (Figure 2B), that allowed us to assign this cluster to αβ KCs. Identification of Kenyon Cells and mushroom body-specific genes. (A) mCherry labeling of MB008B neurons in the Drosophila brain. Neuropil, labeled by nc82 anti-Brp antibody, is shown in grey. (B) Expression of mCherry in the t-SNE-clustered brain cells shown in Figure 1B. mCherry-positive cells are labeled red and identify this cluster as αβ Kenyon Cells (KCs). Intensity of red (or other colors in the panels below) is proportional to the normalized expression level. (C) and (D) Expression of eyeless and Dop1R2 (damb), in t-SNE-clustered brain cells. The three numbered clusters containing indigo cells are KCs. (E) Expression of sNPF, Fas2 and trio in the three t-SNE clusters numbered in (C) and (D). Cells in light blue, orange and purple express each of these genes in αβ, γ, and α´β´ KCs, respectively. sNPF and Fas2 are mostly expressed in αβ and γ KCs, while trio is mostly detected in γ and α´β´ KCs. (F) Violin plots showing the main markers that distinguish KC subtypes from each other (pairwise comparisons for genes expressed in >50% of cells in either cluster; Log2 FC >1.5, Wilcoxon rank-sum test with Bonferroni-corrected p-value<0.01). The column on the right (grey) indicates the level of expression of these genes across all non-MB neurons in the brain. The mushroom bodies are brain structures that are critical for olfactory learning and memory (de Belle and Heisenberg, 1994; Cognigni et al., 2018; Heisenberg, 2003) and they are comprised of three main classes of neurons, the αβ, α′β’ and γ neurons, that are morphologically unique and have dissociable roles in memory processing and expression (Crittenden et al., 1998; Krashes et al., 2007; Trannoy et al., 2011). We first identified the α′β’ and γ KC types, using the expression of the previously known general KC markers eyeless and Dop1R2 (also known as Dopamine receptor in mushroom bodies, damb) (Han et al., 1996; Kurusu et al., 2000). Cells expressing these two markers were contained within three distinct clusters, including the αβ cluster identified as expressing mCherry (Figure 2C–D). The αβ and γ KCs have previously been shown to be distinguishable from the α′β’ neurons using the expression of molecular markers. The αβ and γ KCs express short neuropeptide F precursor (sNPF) (Johard et al., 2008) and Fasciclin 2 (Fas2) (Cheng et al., 2001; Crittenden et al., 1998), whilst α′β’ and γ KCs express the rho guanyl-nucleotide exchange factor gene trio (Awasaki et al., 2000). The expression patterns of these three genes permitted us to assign each KC cluster to one of these KC subtypes (Figure 2E). By comparing gene expression profiles in these KC subsets, we identified 26 additional genes whose expression levels significantly differ between them (Figure 2F). Of these, eleven are involved in gene regulation (pros, Eip93F, Bx, bol, trv, Mef2, mamo, ab, Rbp6, Imp, fru), five in signal transduction (Ca-alpha1T, Pka-C3, CG8641, cmpy, norpA), and three in synapse function (Sytalpha, cmpy, DAT), indicating plausible mechanistic differences between these three major classes of KCs. We independently validated these differential expression patterns by purifying mRNA from the three KC subtypes labeled with mCherry driven by the MB008B (αβ), MB131B (γ) or MB461B (α′β′) GAL4 drivers (Aso et al., 2014) and isolated by Fluorescence Activated Cell Sorting (FACS). Bulk mRNA was extracted from groups of 500–2500 of each KC type and real-time qPCR analysis was used to compare the expression levels for the 29 genes in Figure 2F. Despite the low starting amounts of mRNA, we obtained consistent qPCR signal for thirteen of these genes (Figure 2—figure supplement 1). Importantly, the differences in expression measured by qPCR for these 13 genes precisely matched the profiles detected in the Drop-seq data. These data confirm the accuracy of our measurements of expression with Drop-seq. We assigned two cell clusters containing PNs (Figure 1B), based on the strong expression of previously described markers, including cut (ct) and abnormal chemosensory jump 6 (acj6). The ct gene encodes a homeobox transcription factor involved in dendrite targeting in PNs and is known to be expressed in a subset of the antero-dorsal (ad-), lateral (l-) and ventral (v-) PNs (Komiyama and Luo, 2007). The acj6 gene encodes a POU-domain transcription factor that is also necessary for PN development and has been described to label all adPNs and a subset of lPNs (Komiyama et al., 2003; Lai et al., 2008) (Figure 3C). Although, other cells that are not PNs might express ct and acj6 (Certel et al., 2000), these two putative PN clusters are the only ones strongly expressing, both of these genes. We therefore next focused analyses on these acj6/ct expressing cells and performed a new PCA and t-SNE analysis on the top six PCs. This segregated them into four distinct subclusters, each of which expresses a specific transcriptional signature (Figure 3A–B). Consistent with the expression patterns mentioned above, ct transcripts were found in all four clusters, whereas acj6 was only identified in three (Clusters 1, 2 and 4; Figure 3C). Interestingly, ventral veins lacking (vvl), another POU-domain transcription factor reported to be expressed in acj6-negative lPNs (Komiyama et al., 2003; Li et al., 2017) only labeled a small number of neurons, which were all part of the cluster that was negative for acj6 (Cluster 3; Figure 3C). Our data therefore confirm the non-overlapping expression patterns of acj6 and vvl, and support the assignment of the vvl expressing cluster to cells including the lPNs. Sub-populations of olfactory projection neurons. (A) Re-clustering of the two Projection Neuron (PN) clusters from Figure 1B. Clusters are color-coded. (B) Dot plots showing the main markers distinguishing PN populations from each other (pairwise comparisons for genes expressed in >50% of cells in either cluster; Log2 FC >1.5, Wilcoxon rank-sum test with Bonferroni-corrected p-value<0.01). Dot diameter represents the fraction of cells expressing each gene in each cluster, as shown in scale. Color intensity represents the average normalized expression level. (C) t-SNE-plots for some known markers of PNs. ct labels all PN clusters, acj6 and vvl are mutually exclusive in Clusters 1, 2 and 4, versus Cluster 3, while Lim1 is specifically expressed in Cluster 4. Some of these cells may be antennal lobe local interneurons. To identify putative ventral PNs (vPNs), we used expression of Lim1, which encodes a LIM-homeodomain transcription factor reported to be expressed in most vPNs, but not in adPNs or lPNs (Komiyama and Luo, 2007; Li et al., 2017). Surprisingly, Lim1 labeled one of the three acj6-positive clusters, and several neurons co-expressed both Lim1 and acj6 (Cluster 4; Figure 3C). This contrasts with a previous study that indicated that acj6 and Lim1 do not overlap, as a result of these two genes being expressed in progeny derived from discrete PN neuroblasts (Komiyama and Luo, 2007). About 50% of the acj6-positive neurons were recently shown to express knot (kn), another transcription factor involved in dendrite morphology (Jinushi-Nakao et al., 2007; Li et al., 2017). Consistently, we found that the two acj6+/Lim1- clusters (clusters 1 and 2) segregate according to kn expression (Figure 3B). We also identified three to eight genes in each PN cluster that were significantly over-expressed, as compared to the expression in other PN clusters (Figure 3B). Of potential functional importance, we found that the acj6+/kn+ PNs strongly express the sNPF neuropeptide gene, whereas neurons encompassing the putative lPNs express Tachykinin (Tk). These data suggest that these two classes of otherwise cholinergic neurons might co-release different neuropeptides. Interestingly, the sNPF and Tk neuropeptides have previously been reported to have a modulatory role in the antennal lobe, although these studies concluded that the peptides were released from olfactory receptor neurons and local interneurons, respectively (Ignell et al., 2009; Nässel et al., 2008). More recently, others have also detected the expression of Tk in PNs (Li et al., 2017). The two known neuronal markers embryonic lethal abnormal vision (elav) and neuronal Synaptobrevin (nSyb) (DiAntonio et al., 1993; Robinow and White, 1988) were broadly expressed in most cells but were conspicuously absent from four clusters (Figure 4—figure supplement 1A–B), indicating that these cell populations were possibly not neuronal. One of these clusters expressed a series of genes previously associated with fat body, such as Secreted protein, acidic, cysteine-rich (SPARC), Metallothionein A (MtnA), I'm not dead yet (Indy) and pudgy (pdgy) (Catalán et al., 2016; Knauf et al., 2002; Shahab et al., 2015; Xu et al., 2012) (Figure 1—source data 2). We therefore expect these cells to represent residual fat body tissue that remains after brain dissection. The three other elav/nSyb negative clusters expressed two known glial markers: the homeobox transcription factor reversed polarity (repo) (Xiong et al., 1994) was found at variable levels, while the Na+/K+ transporting ATPase nervana 2 (nrv2) (Sun and Salvaterra, 1995) was broadly expressed in all cells in these clusters (Figure 4—figure supplement 1C–D). Interestingly, one of these three putative glial clusters also robustly expressed the astrocytic leucine-rich repeat molecule (alrm) and wunen-2 (wun2) genes (Figure 4—figure supplement 1E, Figure 1—source data 2), which are known to be specifically expressed in astrocytes (Doherty et al., 2009; Huang et al., 2015). We therefore define these three clusters ‘Glia 1’ and ‘Glia 2’ and astrocytes.. Given the previous morphological subdivision of glia into cortex, neuropil, surface and astrocyte types (Freeman and Doherty, 2006), we also attempted to sub-cluster the glial cell populations, as described above for PNs. 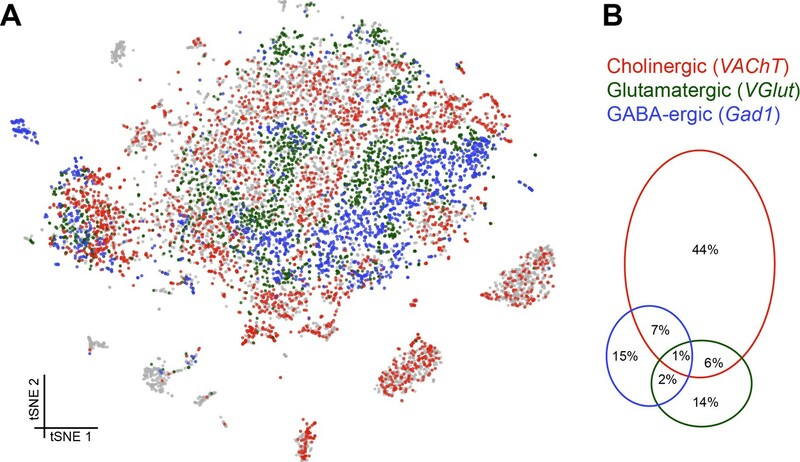 However, this analysis did not reveal additional obvious cluster substructure (Figure 4A), suggesting that at this sequencing depth and number of cells, these three glial populations may be fairly homogeneous. However, we identified a large number of genes that were differentially expressed between these three clusters (Figure 4B, Figure 1—source data 2). Importantly, several genes that are known to be glial- or astrocyte-specific are amongst the 37 genes we found with Drop-seq to be most differentially expressed between these glial clusters (DeSalvo et al., 2014; Huang et al., 2015). Unfortunately, these known markers do not permit us to assign Glial one and Glial two to a particular glial cell-type at this stage. Genetic markers of glial subtypes. 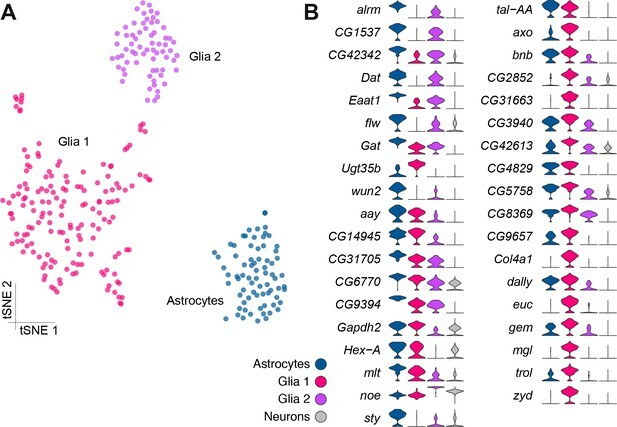 (A) Re-clustering of the glial and astrocyte populations identified in Figure 1B. The same three sub-clusters are identified. (B) Violin plots showing the main markers that distinguish glial subtypes from each other (pairwise comparisons for genes expressed in >75% of cells in either cluster; Log2 FC >2, Wilcoxon rank-sum test with Bonferroni-corrected p-value<0.01). The column on the right (grey) indicates the level of expression of each gene across all neurons in the brain (excluding glia, astrocytes and fat body). Surprisingly, cells in Cluster M robustly express both the neuronal markers elav and nSyb and also the glial nrv2 and a number of other glial markers, although for the majority of them, in lesser amounts than in those clusters we assigned to glia above (Figure 1—source data 2). Since these cells are also notable for not expressing repo (Figure 4—figure supplement 1D), it seems plausible that they represent a novel hybrid cell type. However, we cannot exclude that they arose from fragments of cortex glia that remained attached to neuronal cell bodies. We next assessed the proportion and distribution of cells in our data set that express genes that would indicate they release a particular fast-acting neurotransmitter; acetylcholine (ACh), glutamate (Glu) and gamma-aminobutyric acid (GABA). We determined that cells were cholinergic, glutamatergic or GABA-ergic based on the expression of vesicular acetylcholine transporter (VAChT), vesicular glutamate transporter (VGlut) and glutamic acid decarboxylase 1 (Gad1), three key proteins that are either required for the vesicular loading, or metabolism, of ACh, Glu and GABA respectively. Consistent with our expectations, this analysis labelled the cell clusters that most likely represent KCs and PNs as being cholinergic (Barnstedt et al., 2016; Tanaka et al., 2012), while the ellipsoid body cluster is comprised of GABAergic cells (Figure 5A) (Kahsai et al., 2012). Reassuringly, we did not find significant neurotransmitter marker expression in glia, including astrocytes. (A) t-SNE plot showing the distribution of cells expressing vesicular acetylcholine transporter (VAChT, cholinergic neurons), vesicular glutamate transporter (VGlut, glutamatergic neurons) and glutamic acid decarboxylase 1 (Gad1, GABA-ergic neurons). For graphical reasons only cells expressing each marker above a log normalized value of 2 are shown. (B) Quantification of cells expressing markers displayed in A. The difference to 100% are cells that did not express any of the three markers. Cells expressing these neurotransmitter-specific marker genes were largely exclusive, although 8% of cells contained markers for ACh and GABA and 7% for ACh and Glu. It is therefore conceivable that some cells release excitatory and inhibitory neurotransmitters. A smaller percentage of cells expressed markers for Glu and GABA (3%), of which a third (1%) expressed all three neurotransmitter markers (although these possibly represent multiple cell captures) (Figure 5B). We also analyzed the expression of neuropeptides in our Drop-seq dataset. We first investigated whether individual neuropeptide-encoding genes were preferentially expressed in neurons that co-transmit/co-release a particular fast-acting neurotransmitter ACh, Glu or GABA (Figure 6A). sNPF, CCHamide-2 (CCHa2), Tk, space blanket (spab), jelly belly (jeb) and amnesiac (amn) showed a strong preference for expression in cholinergic neurons, whereas Diuretic hormone 31 (Dh31) is highly biased to GABA-ergic neurons. Neuropeptide-like precursor 1 (Nplp1) and Allatostatin A (AstA) were mainly expressed in glutamatergic cells. Co-expression of neuropeptides with fast-acting neurotransmitters. (A) Radar plots showing the co-expression of 16 neuropeptides with the three fast-acting neurotransmitters. Data represents the relative abundance of cells expressing a neuropeptide and either VAChT (ACh), VGlut (Glut), Gad1 (GABA), combinations of these three genes, or none of them. (B) Co-expression of four insulin-like peptides, including the non-neuronal Ilp6, with fast-acting neurotransmitters. Some other peptide-encoding genes show a strong anti-correlation with a particular transmitter. For example neuropeptide F (dNPF), sNPF, Tk, spab, jeb, Allatostatin C (AstC), Diuretic hormone 44 (Dh44), CCHa2 and Myosuppressin (Ms) were anti-correlated with GABA-ergic cells. Similarly, Myoinhibitory peptide precursor (Mip), pigment-dispersing factor (PDF) and SIFamide (SIFa) were absent from cholinergic neurons. Ms showed an interesting bias for expression in cells that express two (Glu and ACh or Glu and GABA) or all three fast acting neurotransmitters. We also noticed that the specificity towards cells expressing only one type of fast-acting neurotransmitter varied between neuropeptides, with some such as PDF, exhibiting a broad and general expression pattern, other than the anti-correlation with ACh. The abundance and specificity of expression across the midbrain also varied between individual neuropeptides. Some neuropeptide-encoding genes are only expressed in 1–2% of cells (e.g. CCHa2, amn, dNPF, Mip, PDF and SIFa), and their release could therefore potentially represent signals of, for example, internal states. Others, such as spab, sNPF and Nplp1, are very broadly expressed in 20–25% of all cells (see Figure 1—source data 1), suggesting that these neuropeptides likely act as modulatory co-transmitters with fast-acting neurotransmitters. Some neuropeptide expression patterns are highly specific to certain cell types. For example, Dh31 is mainly expressed by ellipsoid body neurons whereas sNPF is strongly expressed in αβ and γ KCs (Figure 2E), in acj6+/kn+ PNs (Figure 3B) and in clusters C and D, that have not yet been assigned to a specific cell-type. Furthermore, although both spab and Nplp1 are very broadly expressed, their expression patterns are strongly anti-correlated, suggesting that they may have complementary functions in the Drosophila midbrain. We also found transcripts for the Drosophila insulin-like peptides 2, 3, 5 and 6 (Figure 6B). The Ilp2, Ilp3 and Ilp5 peptides are exclusively expressed in IPCs in the brain, whilst Ilp6 is expressed in glia (Brogiolo et al., 2001; Okamoto et al., 2009). We found that Ilp2, 3 and 5 expression was only weakly correlated with that of neurotransmitters, whilst Ilp6 expression is strongly correlated with cells that do not express neurotransmitter markers, but that are positive for the glia-specific genes repo and nrv2 (Figure 4—figure supplement 1) (Freeman et al., 2003; Sun and Salvaterra, 1995; Xiong et al., 1994). We used expression of the vesicular monoamine transporter (Vmat) gene to identify monoaminergic neurons in our midbrain dataset (Figure 7A). Three discrete cell populations clearly expressed Vmat. We performed a new PCA and tSNE analysis on cells from these three clusters, guided by known markers for serotonin (5-HT), tyramine (TA), octopamine (OA) and dopamine (DA) releasing neurons. Dopa decarboxylase (Ddc) labels 5-HT and DA neurons, Serotonin transporter (SerT) and Tryptophan hydroxylase (Trh) mark 5-HT neurons, pale (ple; tyrosine hydroxylase) and Dopamine transporter (DAT) DA neurons, Tyrosine decarboxylase 2 (Tdc2) TA and OA neurons, Tyramine β-hydroxylase (Tbh) OA neurons. These labels allowed us to identify the neuronal clusters corresponding to each of these cell types (Figure 7B). Genetic markers and co-transmission in monoaminergic neurons. (A) Expression of the Vesicular Monoamine Transporter (Vmat) labels three clusters from Figure 1B (cells in indigo, highlighted with arrowheads and circles. (B) Re-clustering of the three cell populations labeled in (A). Four sub-clusters are identified, representing dopaminergic, tyraminergic, octopaminergic, and serotonergic neurons. (C) Dot plots showing the main markers distinguishing monoamine populations from each other (pairwise comparisons for genes expressed in >50% of cells in either cluster; Log2 FC >1, Wilcoxon rank sum test with Bonferroni-corrected p-value<0.01). Dot diameter represents the fraction of cells expressing each gene in each cluster, as shown in scale. Color intensity represents the average normalized expression level. (D) Percentage of cells in each monoaminergic cluster that are co-expressing markers for fast neurotransmitter-releasing neurons (VGlut, Gad1, and VAChT). (E) Dot plots showing expression of genes encoding neuropeptides and neuropeptide amidating enzymes across monoaminergic populations. Dot diameter represents the fraction of cells expressing each gene in each cluster, as shown in scale. Color intensity represents the average normalized expression level. (F) Comparison of genes overexpressed in PAM dopaminergic neurons compared to the rest of the brain, measured with Drop-seq or with FACS and Smart-seq2. 9 of the 15 genes identified with Drop-seq (labeled in bold) were also found in the Smart-seq2 dataset. 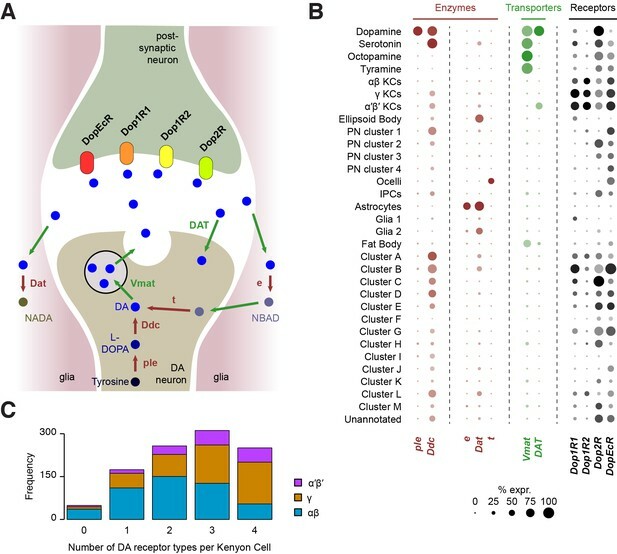 In addition to known markers of monoaminergic neuronal types, we found new genes expressed in these populations (Figure 7C), that are likely to have an important role for their development and connectivity, such as kekkon 1 (kek1) in dopaminergic neurons (DANs) (Ghiglione et al., 1999), or IGF-II mRNA-binding protein (Imp) and Jim Lovell (lov) in serotonergic neurons (Bjorum et al., 2013; Geng and Macdonald, 2006; Munro et al., 2006). High expression in TA neurons of hikaru genki (hig), which encodes a protein generally found in the synaptic clefts of cholinergic synapses (Nakayama et al., 2014; 2016), may highlight the importance of cholinergic input to these neurons. Many neurons release more than one neurotransmitter. We therefore investigated whether the different types of monoaminergic neurons co-expressed markers for fast-acting transmitters. The most striking evidence in these analyses suggest that many octopaminergic and tyraminergic neurons likely co-release Glu, and less of them GABA, or ACh. (Figure 7D). We also tested whether monoaminergic neurons co-expressed neuropeptide genes. Many mature neuropeptides are amidated at their C-terminus through the sequential enzymatic action of the Phm- and Pal2-encoded peptidylglycine-alpha-hydroxylating monooxygenase and peptidyl-alpha-hydroxyglycine alpha-amidating lyase (Han et al., 2004; Jiang et al., 2000; Kolhekar et al., 1997). These genes were expressed in 50% and 81% of all monoaminergic neurons, respectively (Figure 7E), suggesting that a significant proportion of monoaminergic neurons likely co-release neuropeptides. Indeed, we found expression of Dh44, Nplp1, Glycoprotein hormone beta 5 (Gpb5) and Proctolin (proc; which is not amidated) in up to 21% of DANs (Figure 7E). 61% of DANs express at least one neuropeptide and 32% express two, or more. Dh44, Nplp1 and spab were found in up to 30% of 5-HT neurons, with 90% of these expressing one or two neuropeptides (Figure 7E). Perhaps surprisingly, OA and TA neurons contained mRNA for many neuropeptides. We found that 85% of OA neurons express at least one neuropeptide, whereas 46% express two, or more. Co-expression was even more evident in TA neurons; 83% expressed one, whereas 78% express two or more. Nplp1, Gpb5, and SIFa were detected in TA and OA neurons, whereas Dh44, Ms and spab were only identified in OA neurons, and sNPF, Dh31, Mip, Ilp2 and ITP were exclusively found in TA neurons (Figure 7E). Dh44 was the most broadly expressed, being detected in 46% of OA neurons. Mip and SIFa were each expressed in 44% of TA neurons, and were co-expressed in 33% of them. Together, these results indicate that neuropeptide expression, and co-expression, is a common feature of many monoaminergic neurons. The obvious complexity and possible heterogeneity of neuropeptide expression may reflect functional specialization of individual, or small groups of these monoaminergic neurons. Prior work has shown that DANs are anatomically and functionally divisible based on roles in motivation, learning and memory and arousal (Huetteroth et al., 2015; Krashes et al., 2009; Nall et al., 2016; Yamagata et al., 2015). Some of this DAN subdivision has also been associated with the expression of particular transcription factors, receptors for specific neuropeptides, or other monoamines (Bou Dib et al., 2014; Ichinose et al., 2015; Krashes et al., 2009). DANs implicated in learning and memory reside in two discrete clusters, called PPL1 and PAM. PPL1 DANs mostly convey the negative reinforcing effects of aversive stimuli, such as electric shock, high heat or bitter taste (Aso et al., 2012; Das et al., 2014; Galili et al., 2014), whereas the numerically larger PAM cluster contains DANs that appear somewhat specialized in representing particular types of rewards, such as the sweet taste and nutrient value of sugars, or water (Burke et al., 2012; Huetteroth et al., 2015; Lin et al., 2014; Liu et al., 2012; Yamagata et al., 2015). Prior work demonstrated that PAM DANs express the transcription factor 48 related 2 (Fer2), which is required for their development and survival (Bou Dib et al., 2014). We found that 44 neurons in the DA cluster (37%) express Fer2 (Figure 7B). We therefore consider these Fer2-positive cells to represent PAM DANs. 15 additional genes are significantly over-expressed in these cells, in comparison to the rest of the brain (Figure 7F). Amongst them we found Ddc, ple, Vmat and DAT, that are essential for DA synthesis, vesicle loading and transport (Yamamoto and Seto, 2014). Potential new markers for PAM DANs include the transcription factor scarecrow (scro), the amino-acid transporter Jhl1-21, the Dpr-interacting protein DIP-delta, the PDGF- and VEGF-related growth factor Pvf3, the EGFR modulator kek1, as well as five novel genes; CG1402, CG13330, CG17193, CG10384 and CG42817. To corroborate the expression of these new markers in PAM neurons, we compared this data to a transcriptome profiling dataset that we acquired from sequencing mRNA extracted from populations of GFP labeled PAM DANs. We used R58E02-GAL4, a PAM-specific line (Liu et al., 2012; Pfeiffer et al., 2008) to express UAS-6xGFP (Shearin et al., 2014) specifically in PAM DANs, and purified the cells by FACS. We prepared mRNA from GFP + and GFP- neurons, which was subsequently reverse-transcribed and amplified using Smart-seq2, and sequenced. This analysis identified about 10 times more (143) genes that were significantly over-expressed in PAM neurons, as compared to the number retrieved with Drop-seq (Figure 7F). This return is consistent with previous reports showing a higher recovery rate with Smart-seq2 compared to Drop-seq, but also higher levels of noise, as Smart-seq2 does not employ UMIs (Ziegenhain et al., 2017). Of the 15 genes found to be over-expressed in PAM neurons in the Drop-seq experiment, 9 (ple, DAT, Fer2, JhI-21, scro, DIP-delta, CG10384, CG17193 and CG42817) were also retrieved in the Smart-seq2 data (Figure 7F). This confirms that these genes are specifically expressed in PAM neurons. Furthermore, with the exception of ple, DAT and Fer2, these genes have not been previously localized to PAM neurons, and therefore represent novel markers for this cell-type. Localization of genes involved in dopamine metabolism and signaling. (A) Schematic of a dopaminergic synapse, representing the major proteins involved in dopamine signaling and metabolism. Drawing inspired by Yamamoto and Seto (2014) (B) Dot plots showing the expression of these genes across all cell populations identified in the Drosophila brain. Dot diameter represents the fraction of cells expressing each gene in each cluster, as shown in scale. Color intensity represents the average normalized expression level. (C) Histogram showing the number of DA receptor types in Kenyon Cells (as labeled in Figure 2C & D). Most cells express a combination of several receptor types. Other cell types also express combinations of DA receptors, to varying degrees. In addition to KCs, Dop1R1 (dumb) and Dop1R2 (damb) are found in a few other clusters (Figure 8B), in particular in several of those that we could not attribute to any cell type. This information will be helpful for further characterizing these clusters. Consistent with evidence showing that Dop1R1 is expressed in the Central complex where it regulates arousal (Kahsai et al., 2012; Lebestky et al., 2009), we found limited expression of Dop1R1 in the ellipsoid body,suggesting that only a subset of these neurons are involved in this process. Dop1R1 also seems to be expressed in small numbers of monoaminergic neurons, suggesting that it may play a role in autocrine signaling. However, the main candidate receptor for DA autocrine signaling is Dop2R, which was found to be broadly expressed in DANs, and also in large numbers of other monoaminergic neuronal types (Figure 8B). Interestingly, Dop2R expression was also detected in some PNs and IPCs as well as a few non-attributed clusters, which indicates that the activity of these neurons is also subject to dopaminergic modulation. Finally, the Dopamine/Ecdysteroid receptor (DopEcR) was found in several cell types, including KCs, PNs, the ocelli, and many other non-attributed clusters (Figure 8B), suggesting a broad role for this receptor. Expression of this DopEcR in PNs corroborates previous data showing its involvement in pheromone sensitization in these neurons, both in flies and moths (Abrieux et al., 2014; Aranda et al., 2017). DA signaling is regulated by enzymatic degradation and reuptake through transporters. Recycled metabolites can then be used to resynthesize DA. These steps can occur in different cell types, that could be DA-releasing cells, post-synaptic neurons, or glia (Yamamoto and Seto, 2014) (Figure 8A). We therefore used our Drop-seq data to determine which cell types expressed components of the DA recycling and metabolic pathways. As expected, the first step of DA synthesis, conversion of tyrosine into the DA precursor L-DOPA catalyzed by the ple-encoded Tyrosine hydroxylase appears to occur exclusively in DANs (Figure 8B). In comparison Ddc, which converts L-DOPA to DA, is also involved in 5-HT synthesis, and so was expressed in DA and 5-HT neurons. Interestingly, Ddc also labels several other neuronal populations, including α′β’ and γ KCs, one cluster of olfactory PNs, and several non-identified, alphabet labeled clusters (Figure 8B). It is not clear if Ddc in these neurons is involved in the metabolism of DA or other aromatic L-amino acids. Three enzymes have been described to play a role in DA degradation and recycling. The ebony (e) gene product converts DA into N-beta-alanyldopamine (NBAD) (Hovemann et al., 1998; Suh and Jackson, 2007) and was almost exclusively expressed in astrocytes in our data (Figure 8B). Dopamine-N-acetyltransferase, encoded by Dat, converts DA into N-acetyl dopamine (NADA). Interestingly, Dat was abundant in astrocytes, in smaller amounts in other glia, and was also detected in the ellipsoid body and a few other subsets of neurons (Figure 8B). Although these results highlight the important role of glia, and in particular astrocytes, in DA reuptake, metabolism and recycling, other cells appear to convert DA into NADA rather than into NBAD. The fate and consequence of these two metabolites in each cell type remains largely unknown. Finally, tan (t), a gene coding for a hydrolase that can convert NBAD back into DA, was not found in any cell population from the central brain itself (Figure 8B), suggesting that this recycling pathway is not utilized there. However, several cells from the ocelli express this enzyme, consistent with the function of t in histamine metabolism in photoreceptors (Borycz et al., 2002; True et al., 2005). The vesicular monoamine transporter (encoded by Vmat) transports DA, 5-HT, OA and TA into synaptic vesicles (Martin and Krantz, 2014). As already mentioned, Vmat was detected in all these neuronal types. In addition, Vmat expression was evident in fat body cells. Although this has, to our knowledge, never been demonstrated in flies, perivascular adipose tissue in rats contains monoamines acting on the sympathetic nervous system, and is thus likely to express VMAT (Ayala-Lopez et al., 2014). The DAT-encoded DA transporter mediates DA reuptake by DANs. Unlike Vmat, DAT was specifically expressed in dopaminergic, but not other monoaminergic neurons. Surprisingly, we also found DAT expression in α′β’ KCs, suggesting that these neurons might tightly regulate the duration and magnitude of the DA signals that they receive. The response of a neuron to a particular neurotransmitter is determined by the types of receptors that that cell expresses. In addition, most ionotropic neurotransmitter receptors are oligomers comprised of combinations of subunits, variations of which can have very different functional characteristics (Sattelle et al., 2005). Acetylcholine is a major excitatory neurotransmitter in the insect brain and is the primary fast-acting neurotransmitter released from olfactory receptor neurons, olfactory PNs and mushroom body KCs. Nicotinic acetylcholine receptors (nAChR) are heteropentamers that can be comprised of 2 or three alpha and the corresponding 3 or two beta subunits. Flies have seven alpha subunit genes and 3 types of beta encoding genes. These receptors have mostly been studied at the vertebrate neuromuscular junction (Albuquerque et al., 2009) and very little is known about the composition of nAChR in neurons in a central nervous system. Although gene expression cannot explicitly inform of subunit composition, co-expression is a prerequisite that limits the potential complexity in any given neuron. We therefore analyzed the co-expression of nAChR subunits using all cells from our Drop-seq dataset. We detected the expression, at varying frequencies, of all seven known nAChR α-subunits, and two of the three known β-subunits in our samples (Figure 9A). α1, α5, α6 and α7 are expressed in considerably more cells than α2, α3 and α4, whereas β1 is expressed in more than twice as many cells as β2. Most subunits are broadly expressed across all cell types, although some exhibit very distinct expression patterns. Most notably, α3 is broadly expressed in the midbrain, but distinctly absent in KCs. We also tested for co-expression of different combinations of receptor subunits (Figure 9B). Expression of α5 most strongly correlated with expression of α6 and β1. In contrast α3 weakly correlated with expression of α6 and β2 and α2 weakly with α4. Some of the patterns of expression are consistent with previously published pharmacological studies that tested for co-assembly of receptors by co-immunoprecipitation using α-Bungarotoxin (Chamaon et al., 2002; Schulz et al., 2000). For example, cells that express nAChR-α1 most frequently also express α2, when compared to all other nAChR subunits and these two subunits have been shown to preferentially co-assemble into the same receptor complex (Chamaon et al., 2002; Schulz et al., 2000). 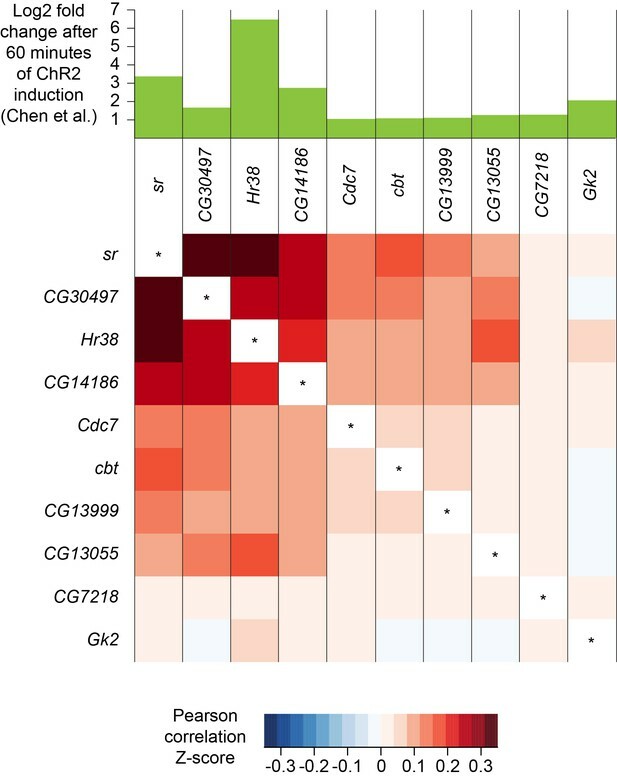 Similarly, β1 is the most frequently co-expressed subunit in β2 expressing cells, again confirming previous co-immunoprecipitation experiments. We also detected high expression levels of the secreted protein quiver (qvr), a Ly-6/neurotoxin family member, in most neurons of our sample, with no preference for neurons using a particular transmitter (see Figure 1—source data 1). The mammalian homologue of quiver, lynx1, has been shown to bind and regulate nAChR in the mammalian nervous system (Miwa et al., 1999). Expression patterns of nicotinic acetylcholine receptor subunits. (A) Prevalence of nicotinic receptor subunits. 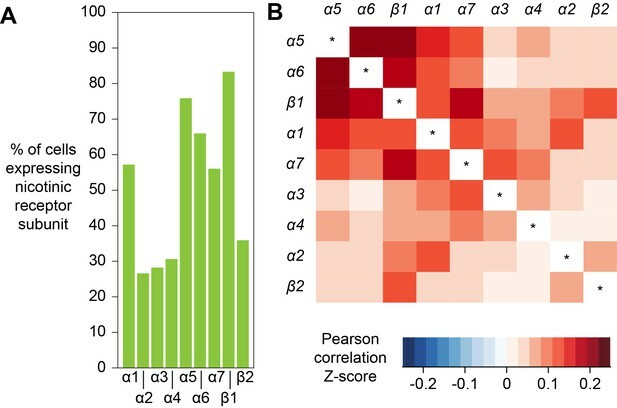 (B) Heatmap showing Pearson correlation coefficient Z-scores for each receptor subunit pair. A recent study identified a set of genes whose expression was upregulated in response to prolonged neuronal activation. These activity-regulated genes were identified using differential bulk transcription profiling following broad neuronal activation, using three different artificial stimulation paradigms (Chen et al., 2016). We plotted the expression patterns of the 11 most highly upregulated genes that were identified following pan-neuronal optogenetic neuronal activation and found that 10 of them were also robustly expressed in our dataset (see Figure 1—source data 1). Interestingly, the expression patterns of the most highly upregulated activity-regulated genes were strongly correlated (Figure 10). For example, cells that express the transcription factor stripe (sr) are more likely to also express Hormone receptor-like in 38 (Hr38, p-value<2.2×10−16, Pearson’s product-moment correlation) and CG14186 (p-value<2.2×10−16). These three genes were the most highly upregulated in Chen et al., 2016, following artificial optogenetic neuronal stimulation. Our data therefore demonstrate that they are also likely to be co-regulated in the brain, following ordinary levels of neuronal activity. Co-expression of neuronal activity markers. Heatmap showing Pearson correlation coefficient Z-scores of activity-regulated genes, as reported by Chen et al., 2016 (histogram on top). Ten most highly upregulated genes following ChR2-XXL-induced activation of all neurons that are expressed in the brain, ranked by their correlation. We wondered whether the expression pattern of these activity-regulated genes might highlight areas of the fly midbrain that have a high intrinsic level of activity. However, no specific cluster was prominently marked with the expression of 9 out of the 10 activity-regulated genes tested. Only CG13055 strongly labeled the cluster of γ KCs (Figure 2F and Figure 1—source data 2). We also noticed that expression of most activity-regulated genes was slightly higher in γ KCs. Since prior work suggested that the γ neurons are the least active of all the KC subtypes (Turner et al., 2008), we speculate that activity-regulated gene expression might be part of a homeostatic neuronal response to reduce excitability. Generating an atlas of gene expression of every cell type in the human body is a goal of modern science (Regev et al., 2017). Remarkable recent advance in high-throughput single-cell RNA sequencing methods have brought this ambitious goal within reach. However, the large size of mammalian tissues means that huge numbers of cells need to be sequenced in order to capture a representative sample of the overall number. Insects, such as Drosophila, provide an obvious solution to the tissue size and cell number issues. Flies are complex organisms with tissues that serve analogous functions to many mammalian organs. Moreover, each one of these fly tissues is comprised of a greatly reduced number of cells, compared to their mammalian equivalent. This is perhaps most obvious when considering the brain. Whereas the mouse brain is estimated to contain about 75 million neurons, the Drosophila brain has only 150,000. Since two thirds of these cells comprise the optic lobes, much of the computational cognitive power and behavioral orchestration is handled by about 50,000 neurons in the midbrain. In this study, we describe a global and unbiased single-cell transcriptomic analysis, using Drop-seq (Macosko et al., 2015), that is representative of much of the Drosophila midbrain. 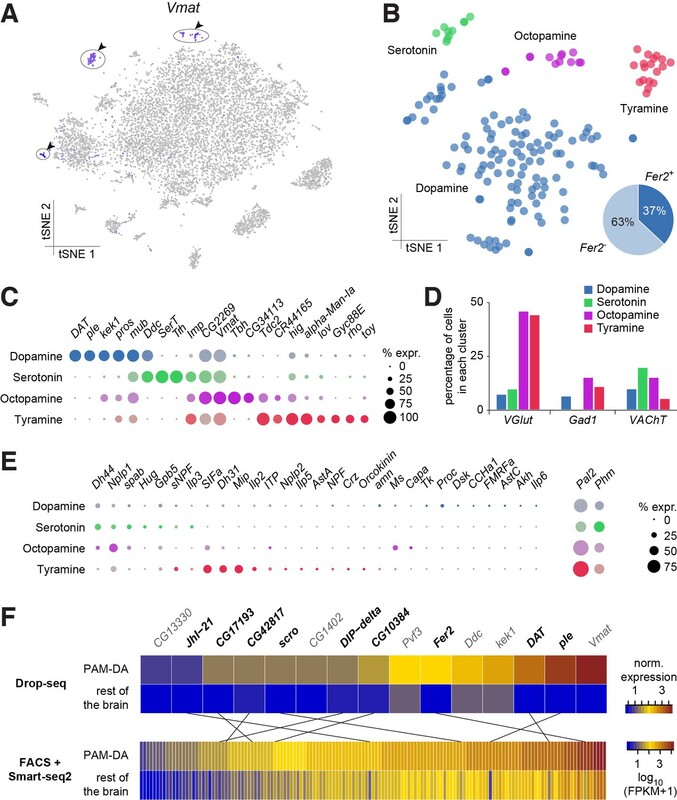 This initial cell atlas of the fly brain provides a unique resource of gene expression across many cell types and regions of neuropil. The extent of neural diversity is not known in any brain. Analysis of the fly therefore provides a useful inroad to this question. Even our initial clustering indicates a high level of neural complexity in the fly brain. Labeling the cluster plot with markers for the ACh, Glu and GABA neurotransmitters reveals that many diverse cells use each of these fast-acting neurotransmitters. For example, although the three major subsets of mushroom body KCs are all cholinergic they each occupy a discrete cluster and are distant to many other cholinergic neurons. The GABA-ergic ring neurons of the ellipsoid body are similarly unique and distinct from other GABA-ergic neurons. At this stage, we cannot tell whether cells in the major KC subtype and ellipsoid body neuron clusters are truly homogenous, or whether further iterative clustering will separate them into additional distinguishable subtypes. We might expect to find that the anatomically unique core, surface and posterior subdivisions of the αβ KCs have unique molecular profiles within the larger αβ cluster (Aso et al., 2014; Hattori et al., 2017; Ito et al., 1997; Lee et al., 1999; Lin et al., 2007; Perisse et al., 2013; Tanaka et al., 2008). Similarly, the ellipsoid body ring neurons might be separable into layer specific subtypes (Wolff et al., 2015). This will require additional analyses and perhaps the collection of more cells. Comparing Drop-seq profiles from the fly brain to those from larger social insects, such as ants and honeybees, and to neurons from the mammalian brain would be useful to address the question of how a larger brain is constructed. As a brain evolves to be bigger, are there many more cell types? Or is there simply an expansion of the number of copies of each cell-type? One might imagine that just expanding the number of identical cortical units, such as pyramidal neurons or mushroom body KCs, increases the computational power of the brain by permitting a higher degree of parallel processing and that the resulting larger networks also provide more storage space. A key element of our analysis here is the ability to assign many single-cell molecular signatures to the relevant cell-type and brain region. We did this using a number of different approaches. Our data was collected from individual neurons taken from brains that specifically express mCherry in the αβ KCs of the mushroom body. This allowed us to unequivocally identify these neurons in our cluster plot and demonstrates the power of sequencing cells from a brain where some specific neurons are genetically labeled. In theory, this strategy can be used to identify the profiles for any Drosophila cell-type in a Drop-seq dataset, providing a corresponding specific GAL4 driver line is available. This is a clear advantage of using Drosophila as a model for a brain cell-atlas, because thousands of GAL4 lines are available that direct expression in specific subsets of neurons in the brain (Gohl et al., 2011; Jenett et al., 2012; Tirian and Dickson, 2017). Cell-specific transgene expression therefore presents the most straightforward means to link single-cell sequencing data to neuroanatomy and will be very useful to de-orphan our currently ‘unannotated’ cells. The extensive collection of cell-specific GAL4 lines were constructed by fusing potential regulatory regions from genes to GAL4 coding sequence (Jenett et al., 2012; Pfeiffer et al., 2008; Tirian and Dickson, 2017). Their expression patterns can therefore indicate elements of the expression of the gene from which they are taken. We also used this property of the GAL4 collections to help us assign single-cell data to specific neurons. For example, we originally suspected that one of the clusters corresponded to ellipsoid body ring neurons because cells in the cluster expressed the Gad1 marker for GABA-ergic neurons and Fas2, an antibody for which is known to label this region of neuropil (Whited et al., 2007). To corroborate this assignment to ellipsoid body we asked whether promoter-GAL4 lines constructed from some of the other top new markers for this cluster, such as Dh31 and Sox21b, labeled ellipsoid body ring neurons (Jenett et al., 2012; Tirian and Dickson, 2017). Indeed, we found that the R20A02 (Dh31) and R73A06 (Sox21b) GAL4 drivers very specifically express in these neurons, as do other drivers corresponding to the ellipsoid body expressed genes Dichaete (R12G08), SoxN (R40E11, R41G11, VT004444), ara (VT029750) and gprk2 (R13C06, R13F12). Therefore, by combining the expression of known markers, and querying the specificity of new markers, it is possible to convincingly assign transcriptional profiles to cell-type. Our initial analyses of the brain cell-atlas also immediately provided a lot of new information that is of functional importance. We focused our first investigations on neurotransmitter usage and the potential for synaptic co-release/co-transmission. These analyses clearly defined the main fast-acting transmitters used by each cell cluster. For example, the KC transmitter was fairly recently determined to be ACh (Barnstedt et al., 2016) and consequently all the KC clusters strongly labeled with the cholinergic markers ChAT and VAChT. The cell-atlas dataset therefore allows one to easily determine the neurotransmitters that a particular cell-type uses, providing the cells of interest can be identified in the cluster plot. Important questions can also be addressed even without identifying how particular cells appear in the cluster plot. One example is our analyses of potential co-release of multiple fast acting transmitters or fast-acting transmitters with neuropeptides. Our data suggest that a small percentage of neurons might co-release ACh and Glu, or ACh and GABA. Analyzing co-expression of transmitter marker genes and neuropeptide-encoding genes revealed some very interesting and novel findings. We found that some neuropeptides (Clynen et al., 2010; Hewes and Taghert, 2001; Nässel and Winther, 2010), whether expressed in many or only a few cells, are exclusively detected in neurons that use a particular fast-acting transmitter. These correlations suggest a fine relationship between the fast-acting transmitter and neuropeptide-specific modulation. Our co-expression analyses also reveal extensive expression of neuropeptide-encoding and processing genes in monoaminergic neurons. It will be interesting to test whether the apparent heterogeneity of neuropeptide expression in these neurons contributes to their apparent functional specialization (Aso et al., 2012; 2014; Burke et al., 2012; Claridge-Chang et al., 2009; Huetteroth et al., 2015; Krashes et al., 2009; Lin et al., 2014; Liu et al., 2012; Yamagata et al., 2015). The brain cell atlas is of great use to those with a gene-centered view of fly neurobiology. It is now possible to query the atlas and ask how broadly, or cell-specifically, a given gene is expressed. Our initial clustering allows one in some cases to pinpoint the expression to a defined cell-type and region of neuropil. This seems particularly valuable information if one is working with a gene, for example, one that has been implicated in neural disease, but does not know the anatomical context in which it operates. Similarly, if a constitutive mutant fly strain has pleiotropic effects, the expression pattern of the gene can indicate where the different phenotypes might manifest. Moreover, the brain-atlas dataset can provide these answers quickly for multiple genes, and it therefore represents a terrific complement to the usual time-consuming and ‘single-gene at a time’ approaches, such as technically challenging in-situ hybridization to RNA, generating antibodies, making promoter fusions, or knocking in epitope tags to individual loci. Perhaps most importantly, querying the cell-atlas provides single-cell resolution of gene expression across all the major cell-types in the fly midbrain. We believe that the potential uses for the cell atlas are almost endless. The data reveal a huge number of new genetic markers for known cell types, and as yet undefined cell types, in the fly brain. Many of these are likely to be functionally important and represent new entry points to guide interventionist experiments to understand how specific molecules operate within the relevant neurons and networks. Although we focused most of our analyses on neuronal cells, different classes of glia (Freeman, 2015) could also be defined. Our initial analysis was performed on 10,286 of the highest quality cells (≥800 UMIs) from a larger dataset of 19,260 cells. This atlas is effectively a scaffold that can now be continuously updated and expanded as additional cells are collected and sequenced (Davie et al., 2017; Konstantinides et al., 2018). Our current dataset was derived from cells taken from unique groups of flies, processed on eight separate days, and yet each biological replicate contributed equally to the combined data set. This robustness and reproducibility of the approach is essential to know in order to be able to add data from future experiments to the current cell cluster. Including more cells with a comparably high number of UMIs per cell should increase statistical power and permit further resolution of cell-type. Including more cells with a lower number of UMIs per cell did not improve our analysis. The current dataset was collected from young flies that were raised under ideal conditions with ample food and water. Future experiments that aim to investigate the impact of changes to the state of the fly, such as age, bacterial infection and starvation, can use the current cell atlas as a foundation to identify changes in expression patterns that may occur in individual cells across the midbrain. Similarly, brains from flies harboring specific mutations can be molecularly characterized using the approach described here, to uncover molecular manifestations of the mutant phenotype. The fly brain cell atlas described here should also be a valuable resource to researchers working in other animals. Many markers for Drosophila cell-type are likely to be conserved in other insects and arthropods, and so will be useful markers for regions of the brain in these animals (Thoen et al., 2017; Wolff and Strausfeld, 2015). The orthologs of some of these new markers, for example those expressed in subsets of dopaminergic neurons, might also extend to labeling comparable cells in the mammalian brain. The Drosophila strains used were MB008B, MB131B and MB461B (Aso et al., 2014), R58E02 (Pfeiffer et al., 2008), w-;+;20XUAS-6XGFP (Shearin et al., 2014) and w-; +; UAS-mCherry. Flies were raised at 25°C in 12 hr:12 hr day-night cycles on standard food at 40–50% humidity. S2 cells (Gibco, R69007) were grown in Schneider’s medium (Gibco 21720–001) supplemented with 10% FBS (Sigma, F0804) and 1% penicillin-streptomycin (Gibco, 15070–063). Sf9 cells (Gibco, 12659–017) were grown in Sf-900 III SFM (Gibco, 12658019). The Master Seed Bank for both Sf9 and S2 cells was tested for contamination of bacteria, yeast, mycoplasma and virus and characterized by isozyme and karyotype analysis by the supplier. All cells were incubated at 25°C. Cells were grown in adherent cultures to confluency. Vessels were gently tapped to detach cells, and supernatants were centrifuged for 10 min at 100 x g. Cells were washed once with 1 x PBS and resuspended in 1 x PBS and subsequently diluted to 200 cells/ul prior to pooling and Drop-seq. The brain dissociation protocol was adapted from previously described methods (Harzer et al., 2013; Nagoshi et al., 2010). For each day of experiments, 80–100 central brains were individually dissected in ice-cold calcium- and magnesium-free DPBS (Gibco, 14190–086) and immediately transferred into 1 mL toxin-supplemented Schneider’s medium (tSM: Gibco, 21720–001 + 50 µM d(−)−2-amino-5-phosphonovaleric acid, 20 µM 6,7-dinitroquinoxaline-2,3-dione and 0.1 µM tetrodotoxin) on ice. Brains were washed once with 1 mL tSM and incubated in tSM containing 1.11 mg/mL papain (Sigma, P4762) and 1.11 mg/mL collagenase I (Sigma, C2674). Brains were washed once more with tSM and subsequently triturated with flame-rounded 200 µL pipette tips. Dissociated brains were resuspended into 1 mL PBS + 0.01% BSA and filtered through a 10 µm CellTrix strainer (Sysmex, 04-0042-2314). Cell concentration was measured using a disposable Fuchs-Rosenthal hemocytometer (VWR, 631–1096) under a Leica DMIL LED Fluo microscope, that also allowed detecting mCherry fluorescence in dissociated KCs. Cells were diluted in PBS + 0.01% BSA up to a concentration of 200 cells/µL. Thus a typical preparation from 80 brains yielded ~2’000’000 single-cells in a volume of 10 mL. Drop-seq was performed as described (Macosko et al., 2015), using a Dolomite Bio (Royston, UK) Single Cell RNA-Seq system. Cells were diluted at a concentration of 200 cells/µL into PBS + 0.01% BSA. Barcoded Beads SeqB (ChemGenes Corp., Wilmington, MA, USA) were diluted at a concentration of 200 particles/µL into 200 mM Tris pH 7.5, 6% Ficoll PM-400, 0.2% Sarkosyl, 20 mM EDTA +50 mM DTT. For each run, 700 µL of cells solution from dissociated brains were loaded into a microcentrifuge tube inside a reservoir connected to a Mitos P-Pump (Dolomite microfluidics, 3200016) set to provide a constant flow of 30 µL/min. The reservoir was placed on a stirring plate and agitation was provided by a stir bar placed inside the reservoir but outside the tube to maintain the cells in suspension while avoiding damaging the cells. 600 µL of beads solution were loaded into a 50 cm sample loop connected to a second Mitos P-Pump set to provide a constant flow of 30 µL/min. The sample loop was used to avoid beads sedimentation while eliminating the need for stirring, thus preventing beads damage. QX200 Droplet Generation Oil for EvaGreen (BioRad, 1864006) was loaded directly inside a third Mitos P-Pump, set to provide a constant flow of 200 µL/min. Cells, beads and oil flows were connected to a Single Cell RNA Seq Droplet Chip (Dolomite Bio) according to manufacturer’s instructions, allowing pairing of single-cells with single-beads and formation of 357 pL droplets of aqueous cell/bead solution in oil. The chip was placed under a Meros High Speed Digital Microscope and Camera with a HLB M Plan Apo 5X objective in order to monitor droplet formation. Droplets were collected in 50 mL Falcon tubes. Reagents were reloaded and Falcon tubes replaced every 15 min. Droplets were subsequently broken and beads with captured mRNA were washed as described (Macosko et al., 2015). In brief, bead-bound mRNA was immediately reverse-transcribed using a Template Switch Oligo (5’ – AAG CAG TGG TAT CAA CGC AGA GTG AAT rGrGrG – 3’) and Maxima H Minus Reverse Transcriptase (Thermo Scientific, EP0753). cDNA was treated with Exonuclease I (NEB, M0293L) and amplified in multiple 50 µL PCR reactions performed on aliquots of ~2000 beads, using a SMART PCR primer (5’ – AAG CAG TGG TAT CAA CGC AGA GT – 3’) and Hifi HotStart Readymix (Kapa Biosystems, KK2602) for a total of 17 cycles. 10 µL from each PCR reaction were pooled, and amplified cDNA was purified twice, with 0.6X and 1.0X volumes of Agencourt AMPure XP beads (Beckman Coulter, A63880) and quantified on a Bioanalyzer, using a High-Sensitivity DNA kit (Agilent, 5067–4626). From each sample, 2 × 600 pg of amplified cDNA were tagmented using the Nextera XT DNA Sample Preparation Kit (Illumina, FC-131–1024) with New-P5-SMART PCR hybrid (5' – AAT GAT ACG GCG ACC ACC GAG ATC TAC ACG CCT GTC CGC GGA AGC AGT GGT ATC AAC GCA GAG T*A*C – 3') and one of Nextera N701 to N706 oligos. cDNA libraries were purified twice, with 0.6X and 1.0X volumes of Agencourt AMPure XP beads (Beckman Coulter, A63880) and quantified on a Bioanalyzer, using a High-Sensitivity DNA kit (Agilent, 5067–4626). Libraries were pooled together and sequenced on an Illumina HiSeq2500 sequencer using a Custom Read1 primer (5’ – GCC TGT CCG CGG AAG CAG TGG TAT CAA CGC AGA GTA C – 3’) and standard Illumina Read2 primers. All oligos were synthesized by Sigma, and HPLC purified. Samples from days 1 and 2 were sequenced together, on two separate lanes. Samples from days 3–8 were sequenced together, on three separate lanes. Sequencing data was processed as previously described (Macosko et al., 2015; Satija et al., 2015), following the Drop-seq Computational Protocol v.1.0.1 and using the Drop-seq software tools v.1.13 from the McCarroll lab. Barcodes were extracted and reads were aligned to a combination of the Drosophila melanogaster genome release 6.13 (from Flybase.org) and three reference sequences for mCherry and each split-GAL4 transgenes of the flies that were used in this study. For the species mix experiments, reads were also aligned to the Spodoptera frugiperda genome (Kakumani et al., 2014), available at NCBI GenBank, assembly ASM221328v1. The Flybase v.FB2016_05 September gene names were used for the creation of the Digital Gene Expression (DGE) Matrix. Analysis of DGEs was performed with the Seurat 2.1.0 R package (Macosko et al., 2015; Satija et al., 2015). Cells with less than 200 genes were discarded. Several thresholds for the number of UMIs per cell were tested (see Figure 1—figure supplement 2). All results presented here are based on 800 and 10,000 UMIs per cell as lower and higher threshold, respectively. Data was log-normalized and scaled using default options. Variation driven by individual batches was regressed out from the normalized, scaled data. PCA analysis was performed on the data as previously described (Macosko et al., 2015). To visualize the data, spectral t-SNE dimensionality reduction was performed, using the first 50 PCAs, as instructed by a Jack Straw resampling test (Satija et al., 2015; Van Der Maaten, 2014). Clusters were identified by a shared nearest neighbor modularity optimization (Waltman and van Eck, 2013), using a resolution of 2.5. Some of these clusters were subsequently manually modified (compare Figure 1—figure supplement 2B (unmodified) and Figure 1B (modified)). Main markers for each identified cluster were identified as genes with Log2 FC ≥1 and a p-value of p<0.01 (after Bonferroni correction). Gene co-expression was assessed by calculating the Pearson product-moment correlation of the log-normalized, scaled expression values using R. For the radar plots, the number of cells expressing each neuropeptide of interest and in addition either VACht (to identify cholinergic cells), VGlut (glutamatergic), Gad1 (GABA-ergic) or combinations of the three were calculated and normalized to the total number of cells expressing each neurotransmitter. DGE columns corresponding to cells belonging to either PN or monoaminergic clusters were used for PCA analyses. For re-clustering of monoaminergic neurons, a selection of known markers (ple, DAT, SerT, Trh, Vmat, Oamb, Ddc, Tdc2 and Tbh) was used as input for PCA analysis. In both cases, the first 6 PCAs were used for re-clustering, which was performed as above. Midbrains were dissected from flies expressing mCherry under the control of the MB008B, MB131B or MB461B GAL4 drivers, dissociated and filtered as above. DAPI was added to the cell suspension as a marker for dead cells or cells with compromised membrane (Kubista et al., 1987), and only DAPI- cells were selected. Filtered cells were sorted with a MoFlo Astrios (Beckman Coulter) and mCherry +cells were collected from each genotype, in biological triplicates. Total RNA was extracted from these cells using the PicoPure RNA Isolation Kit (Applied Biosystems, KIT0204) according to manufacturer’s instructions. mRNA was then retrotranscribed using the SuperScript III First-Strand Synthesis SuperMix (Invitrogen, 18080400) according to manufacturer’s instructions. Obtained cDNA was pre-amplified with the KAPA HiFi HotStart ReadyMix (Kapa Biosystems, KK2611), using 0.4 μM of each primer (see primers list in Figure 2—source data 1). Pre-amplification protocol was as follows: 98°C, 2’; 18X [98°C, 20’; 60°C, 30’, 72°C, 30’]; 72°C, 2’. Pre-amplified cDNA was purified with the QIAquick PCR Purification Kit (Qiagen, 28106). qPCR was performed in a LightCycler 480 Instrument II (Roche, 05015243001) using the Universal Probe Library system (UPL; Roche, 04683633001 and 04869877001). Each 10 μL reaction contained 2.4 μL of pre-amplified cDNA, 0.4 μM of each primer (designed with Roche Assay Design Center), 0.2 μM of the corresponding UPL probe (Figure 2—source data 1), and 5 μL LightCycler 480 Probes Master (Roche, 4887301001). Cycles were as follows: 95°C, 10’; 45X [95°C, 10’; 60°C, 30’; Fluorescence acquisition; 72°C, 1’]. Quantification was performed with the comparative 2-ΔΔCt method (Livak and Schmittgen, 2001), using SdhA as a housekeeping gene (Ling and Salvaterra, 2011; Treiber and Waddell, 2017). For each biological replicate, expression levels of each gene were normalized to the KC population with the highest expression level, and subsequently averaged. Genes for which qPCR signal was not consistently observed across all samples and replicates were not included in the analysis. Central brains from flies expressing a brighter, hexameric GFP (20xUAS-6xGFP; [Shearin et al., 2014]) specifically in PAM-DA neurons under the control of the R58E02 GAL4 line (Pfeiffer et al., 2008) were dissected and dissociated as above. FACS was performed as above, and both GFP +and GFP- cells were collected. Cells were lysed, and their mRNA was retro-transcribed and amplified (17 cycles) using the SMART-Seq v4 Ultra Low Input RNA Kit for Sequencing (Takara Clontech, 634890), according to manufacturer’s instructions. Biological triplicates were made for each sample. cDNA libraries were generated with TruSeq RNA Library Prep Kit v2 (Illumina, RS-122–2001), sequenced on an Illumina HiSeq4000 sequencer. Results were analyzed using the Tuxedo RNA-seq pipeline (Trapnell et al., 2012). Frontiers in Behavioral Neuroscience 8:312. Frontiers in Systems Neuroscience 11:56. Pharmacology Research & Perspectives 2:e00041. The Journal of Neuroscience 22:10549–10557. Advances in Experimental Medicine and Biology 692:192–210. The Journal of Neuroscience 13:4924–4935. Cold Spring Harbor Perspectives in Biology 7:a020552. Molecular and Cellular Biology 26:9508–9516. Current Opinion in Neurobiology 37:59–65. The Journal of Comparative Neurology 507:1479–1496. The Journal of Neuroscience 17:1363–1376. The Journal of Cell Biology 172:577–588. Developmental dynamics : an official publication of the American Association of Anatomists 244:540–552. The Journal of Comparative Neurology 508:711–755. Journal of Machine Learning Research : JMLR 15:3221–3245. The European Physical Journal B 86:471. Journal of Comparative Neurology 523:997–1037. Thank you for submitting your article "Cellular diversity in the Drosophila midbrain revealed by single-cell transcriptomics" for consideration by eLife. Your article has been reviewed by three peer reviewers, one of whom, Mani Ramaswami, is a member of our Board of Reviewing Editors, and the evaluation has been overseen by K VijayRaghavan as the Senior Editor. The authors describe the use of a very exciting new technology, Drop-seq (Macosko et al., 2015) to determine single-cell transcriptomes from thousands of Drosophila midbrain cells. Based on differences in their transcriptional profiles, the authors group individual cells into dozens of clusters, and thereby characterize the diversity of cell-types in the brain. Within each cluster they map potential correlations in expression of neuromodulators, neuromodulator receptors, and fast neurotransmitters. And most usefully, they use expression of known marker genes to assign several of the clusters to specific anatomically, and in some cases functionally, analysed neuronal cell types. Thus, they establish a first draft database of gene expression in cell-types of the Drosophila brain. Overall, this is an extremely interesting study, describing the application of DropSeq to learn new biology in an intensively studied and important biological system Using newly gained resolution on cell-transcriptome heterogeneity, the work teases apart the cellular complexity of the Drosophila simple brain. Although the analysis largely reports a list of correlations and co-expression percentages, the data provide a level of resolution and a global description of highly interesting and well-studied cells that was not hitherto possible. Using their original data and internal controls, the authors recapitulate several known biological insights gained over years of detailed genetic analyses and deliver several new insights that will be of broad interest to groups studying an advanced system of perception, learning and memory as well as neurobiologists in general. 1) Methods are cryptic in part and need to be elaborated both for clarity and to evaluate intrinsic limitations of the analysis. How did the authors define the specific cell types/brain regions presented in Figure 1B (e.g. fat body)? How were KCs in Figure 7C identified? Which cells are considered for the analyses of nAChRs (Figure 8)? Which GAL4 is used for the optogenetic activation of neurons in Figure 8? 2) In this context, despite the nice control analysis showing that S2 cell and army-worm cell transcriptomes are well separated, there is still a problem that unlike cultured cells, following disruption of a brain even with "trituration," cells may not be easily isolated intact. It would be useful to provide simple images of the cell suspensions to show whether one sees nuclei, single intact cells and/or occasional clumps. The singlet/doublet estimate based on cultured cells is not necessarily a good, transferable measure for dissociated brains where cell sizes, cell adhesion and cell lysis issues can be different and this needs to be addressed in the text and with some data (that may be on hand). Regarding cell lysis: did the authors consider mild fixation and see how this affected sample morphology? 3) The paper would be greatly improved with some more direct functional evidence beyond clustering and identification of highly variable genes as markers. Could the authors provide more evidence of some of the newly found markers via in situ hybridization, antibody staining or reporter lines, for example? The authors should comment explicitly on some apparent discrepancies: genes like fruitless and sNPF have been previously reported to be expressed outside the mushroom body. Data from this study appear to show them to be mushroom body (a/b neuron)-specific. Furthermore, the dopamine transporter (DAT) is expected to be highly expressed in dopamine neurons, DropSeq data indicates that the expression is specifically in a'/b' neurons. What are the implications of these apparent discrepancies to interpretation of the data? 4) The use of literature-based marker genes to specify cell types is certainly a powerful way, but the assignment is not always convincing. Cluster identification to PNs is for example questionable, as many of these marker genes are expressed outside PNs (e.g. Certel et al., 2000 for acj6). Unexpected gene expression patterns (e.g. Ddc expression in PNs and KCs (subsection “Dopamine metabolism”) may also be due to misannotation. This should be addressed experimentally and/or acknowledged in the text. Another example is insulin-like peptide 6 expressing in glia based on the co-expression with the transmitter synthesizing enzymes, but no description about glia-specifying genes like repo. Since cell type annotation is critical, various statements should be moderated to acknowledge the need for further confirmatory experiments. In general, the authors should also consider how reasonable it is to call expression in a binary fashion, instead of in a graded fashion, as cut-offs can be tricky when data are shallow. The text in this regard may needs to be clearer and the presentation of data may need to be adjusted. 1) Methods are cryptic in part and need to be elaborated both for clarity and to evaluate intrinsic limitations of the analysis. How did the authors define the specific cell types/brain regions presented in Figure 1B (e.g. fat body)? As mentioned in the text we used the list of markers presented in Figure 1—source data 2 to assign the identity of each cluster. This list contains all genes that we find to be significantly over-expressed in each cluster, compared to the rest of the brain. For clarity we have modified the text to mention that “We then used the published expression patterns for many of these genes to assign identity to several clusters”. We have also added relevant references to Figure 1—source data 2. How were KCs in Figure 7C identified? As described for Figure 2, we used expression of the transgenically expressed marker mCherry (in αβ neurons) and a number of known KC subtype markers to identify these cells. For example, eyeless and Dop1R2 expression clearly identify the three clusters corresponding to KCs. Many other known KC markers are expressed in these neurons (see Figure 1—source data 2, including sNPF in αβ and γ but not α′β’ and trio in α′β’ and γ but not αβ – Figure 2E). We used all the cells contained in these three KC clusters for the analysis shown in Figure 7C (now 8C). We have now added this detail to the previously missing legend for this figure. Which cells are considered for the analyses of nAChRs (Figure 8)? We used all 10,286 cells described in this paper for this analysis. The text was modified as follows: “We therefore analyzed the co-expression of nAChR subunits using all cells from our Drop-seq dataset”. Which GAL4 is used for the optogenetic activation of neurons in Figure 8? We assume the reviewers are referring to the top panel of Figure 9 in our original manuscript (now Figure 10)? If so, as mentioned in the text, these data were taken from the Chen et al., 2016 paper from the Rosbash lab. In this paper, the authors used the pan-neuronal elav-Gal4 driver to drive ChR2-XXL expression. We have now modified the text to mention that the optogenetic activation in that study was pan-neuronal. Making sure that the solution used for Drop-seq mostly contains single cells is indeed very important. As mentioned in the Materials and methods section, we always filter the cell suspension through a 10 µm (about the size of the cell body of a typical Drosophila neuron) cell strainer prior to Drop-seq and FACS experiments. We are therefore confident that no clumps or particles bigger than 10 µm are included in the cell suspension. We also always verify the quality of our preparation while counting the cells after filtration. As described in the Materials and methods section, we have also discarded all barcodes containing >10,000 UMIs, as these are likely to have arisen from doublets. Although fragments from lysed cells and other smaller particles may be able to pass through the strainer, these are unlikely to contain significant amounts of mRNA and would thus fall below the 800-UMIs threshold of cells that are included in our analysis. We have now added some text to mention the filtration process: “Larger tissue fragments were removed by filtration, and the eluant was inspected under a microscope to confirm the presence of single cells and the absence of clumps”. Despite these precautions, we cannot exclude that, in some occasions, two neighboring cells could remain attached and make their way through the filter and into the analysis. The extent of this phenomenon is extremely difficult to measure, as it depends on the nature of the bonds between each pair of cells. For example, our data suggests that fragments of glia could, in some very rare cases, remain attached to neurons (31 out of 9955 (0.3%) cells expressing neuronal markers also express glial markers – see new paragraph about Cluster M, paragraph three subsection “Identification of glia and astrocytes”). Another possible example that demonstrates that this phenomenon may be possible, but very rare, is that we only find two α′β’ and five γ KCs expressing the αβ-driven mCherry (Figure 2B), and only two α′β’ KCs that express the αβ- and γ-specific sNPF (Figure 2E), even although the somata of these different KC cell types are all tightly interspersed in the brain, and therefore could remain together after dissociation. As for cell survival, we observed in the FACS experiments included in this manuscript that the fraction of DAPI+ cells (DAPI can only penetrate cells with compromised membrane) was always very low. Since the dissociation protocols for FACS and Drop-seq experiments were exactly the same, we are confident that a similarly low number of dead cells was present in our Drop-seq experiments. For completeness of argument, we actually only identified 24 cells of the 10,286 in our dataset that express the two apoptosis markers hid and reaper. Since we estimate that cell survival was high, we did not consider including a fixation step (e.g. methanol method, Alles et al., 2017). However we appreciate that this might be useful to use with more fragile cells (perhaps if looking at pupal brain? ), for cases where cells need to be kept for a few days, or transported, prior to Drop-seq, or for comparison of gene expression between samples when timing is particularly important. Lastly, we could add an image of the cell suspension if the reviewers insist that it’s necessary. However, given the enormous number of cells in the analysis, we believe it would not be convincing and would perhaps be seen as simply cherry-picking an appropriate view. 3) The paper would be greatly improved with some more direct functional evidence beyond clustering and identification of highly variable genes as markers. Could the authors provide more evidence of some of the newly found markers via in situ hybridization, antibody staining or reporter lines, for example? We now include new data that confirms the expression patterns of several of the genes identified in Figure 2F. We used FACS to isolate neurons from each KC subset, and performed qPCR experiments on mRNA extracted from these cells (Figure 2—figure supplement 1). This recapitulates the gene expression observed in the Drop-seq data with outstanding accuracy, and we believe it nicely demonstrates that Drop-seq can be used to reliably identify novel cellular markers. We now mention this experiment in the main text and Materials and methods section, and have added a figure legend for this new supplementary figure. We previously mentioned a few reporter lines in the discussion of the manuscript, whose expression supports our data assignment to the ring neurons of the ellipsoid body. From the FlyLight collection the R20A02 (Dh31) and R73A06 (Sox21b) GAL4 drivers very specifically express in the EB ring neurons neurons. We have now added mention of a few more Gal4 lines, that label the ring neurons. The authors should comment explicitly on some apparent discrepancies: genes like fruitless and sNPF have been previously reported to be expressed outside the mushroom body. Data from this study appear to show them to be mushroom body (a/b neuron)-specific. Furthermore, the dopamine transporter (DAT) is expected to be highly expressed in dopamine neurons, DropSeq data indicates that the expression is specifically in a'/b' neurons. What are the implications of these apparent discrepancies to interpretation of the data? We think we have unfortunately misled the reviewers with the display of the data in this figure. There is no discrepancy with published work with respect to these genes. The rightmost (grey) column in Figure 2F represents global expression across all non-MB neurons. The purpose of this column is simply to indicate how broadly these genes are expressed outside the MB. Genes such as fru, sNPF and DAT are indeed found outside of the MB (see for example Figure 3 for sNPF and Figures 7-8 for DAT). However these genes are expressed in a limited number of the larger population of ‘other’ neurons, hence the “slim” shape of the Violin plots for these genes. This contrasts with other genes like bol or Rbp6, which are broadly expressed across the whole brain, and that we find to be specifically absent from α'β' and αβ, respectively. We have now clarified the legend of Figure 2F to deal with this confusion. We are confident that the neurons that we consider as olfactory PNs in our report at least encompass most of these cells, because these clusters were the only two that strongly co-expressed the well-described PN markers acj6 and cut. We have added a sentence in order to make this clear, and to acknowledge the possibility that these clusters could indeed contain other neurons, that express these two genes but are actually not olfactory PNs, mentioning the Certel et al. paper. 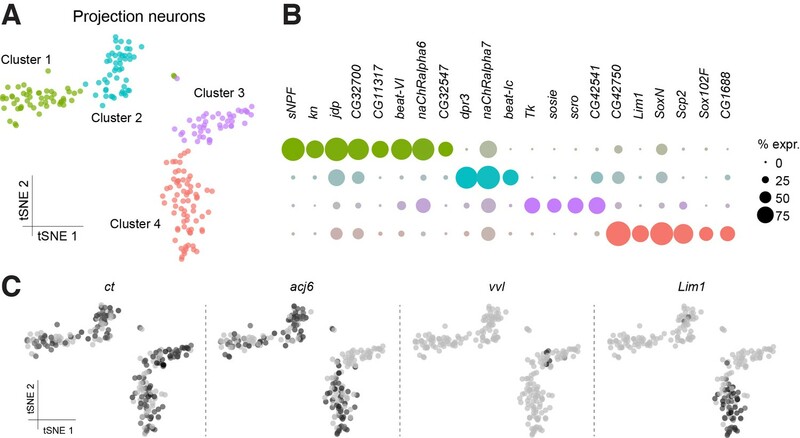 Our iterative clustering however also shows expression of additional markers, known to be expressed in subsets of PNs. In addition to eyeless, Dop1R2, trio, sNPF and Fas2, that are mentioned in Figure 2, we found a host of other known KC markers expressed specifically in the three clusters that we assign as KCs. These include rutabaga, Oamb, Pka-R2, Pka-C1, dachsund, etc, most of which have been shown to play important roles in the development and/or function of the Mushroom Body, and to be robustly expressed in these cells. We are therefore very confident that these cells are KCs. The exhaustive list of these genes, and relevant references linking their expression in the MB, are all mentioned in Figure 1—source data 2. We appreciate that these analyses can identify some things that are unexpected and that perhaps others might find unsettling, based on prior expectations. However, since Ddc is robustly expressed in the same cell clusters as many markers for KCs and PNs, we believe the most parsimonious explanation is that Ddc is indeed expressed in these cells, as shown in Figure 8B. Another example is insulin-like peptide 6 expressing in glia based on the co-expression with the transmitter synthesizing enzymes, but no description about glia-specifying genes like repo. Since cell type annotation is critical, various statements should be moderated to acknowledge the need for further confirmatory experiments. We appreciate that we fell short with this section and have now included a more detailed analysis and new figure (Figure 4) detailing the assignment of glia. We have also added a new supplementary figure (Figure 4—figure supplement 1) that highlights the cells in the tSNE plot that express the neuronal markers elav and nsyb as well as repo, nrv2 (glia markers) and alrm (astrocyte marker). 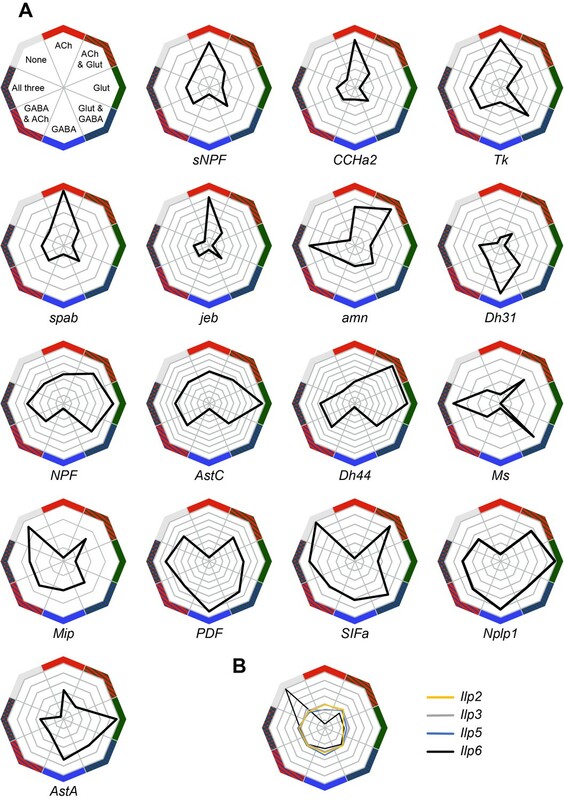 These non-neuronal clusters express large numbers of other glial-specific genes and show minimal labelling for genes involved in defining fast-acting neurotransmitter labelling in Figure 5A. This new supplementary figure also demonstrates that Ilp6 is indeed co-expressed with these glial genes and not with neuronal markers, thus confirming its expression in glia. We have added the following sentence in the appropriate section of the manuscript: “…whilst Ilp6 expression is strongly correlated with cells that do not express neurotransmitter markers, but that are positive for the glia-specific genes repo and nrv2 (Figure 4—figure supplement 1). In general, the authors should also consider how reasonable it is to call expression in a binary fashion, instead of in a graded fashion, as cut-offs can be tricky when data are shallow. The text in this regard may needs to be clearer and the presentation of data may need to be adjusted. Unfortunately there has also been a misunderstanding here. We totally agree with the reviewers that defining cut-offs for expression can be tricky. For this reason, we actually did not binarize our data in the majority of our analyses. The co-expression analyzes presented in Figures 9 and 10 use non-binary expression values, and of the 18 plots that visualize expression of specific genes in our manuscript (24 in the revised version), only 2 contain data that was binarized (Figure 1—figure supplement 4B and Figure 5A). In Figure 1—figure supplement 4B it seemed appropriate to binarize expression of roX1 because we observed that roX1 expression exhibited a biphasic distribution of values. In addition, since roX1 was previously reported to be male-specific and therefore absent in females, we decided that it would be helpful, in this particular case, to show roX1 expression in a binary manner. In Figure 5A, we decided to threshold the expression for graphical reasons. To reiterate, for all but two of the analyses, the data have not been called in a binary manner. We thank the Bloomington Stock Center for flies. We are grateful to Michal Maj for help with FACS, Paola Cognigni for help with R and statistics, and other members of the Waddell lab for discussion. RNA-sequencing was performed at MacroGen Inc. and the Oxford Genomic Centre. CT was supported by a Wellcome Trust PhD studentship and SW is funded by a Wellcome Trust Principal Research Fellowship in the Basic Biomedical Sciences (200846/Z/16/Z) and the Bettencourt-Schueller Foundation. © 2018, Croset et al.